Comment: Dark but always red. Many red zircons have a significant brown tone or are primarily orange, not this one though. 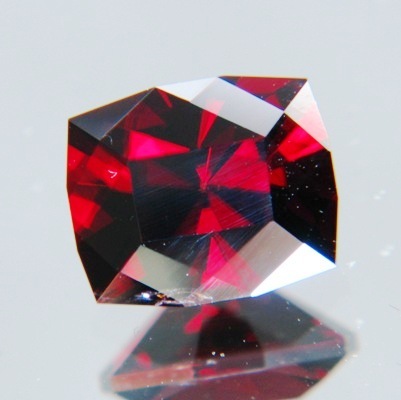 Clearly, it is a very dark red but also well saturated (bright vivid red zircons competes with spinel in price). This stone was precision cut in Germany. Though the image shows an inclusion in the outer edge it is not visible to the unaided eye and would also disappear in a setting. If you search for a unique natural pure red gem in big size and perfect cut, this is a great opportunity at microscopic $400/carat or less if you are a member.